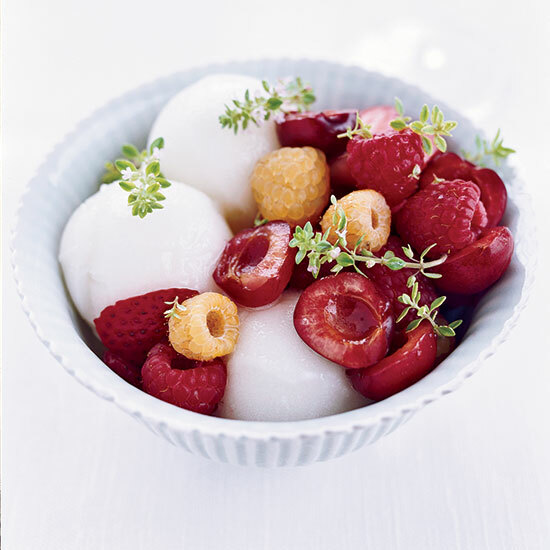 Simple and refreshing sorbets are super easy to make. Whether served as a palate cleanser or a deliciously chilled dessert, here are seven excellent sorbets to cool off with this summer. Strawberry sorbet (homemade or store-bought) is a delicious complement richly flavored balsamic-infused fruit salad. Andrew Zimmern makes this recipe all summer long with everything from orange sunburst cherry tomatoes to Valencias to German Striped. He says the bigger the acidity and sweetness of the tomatoes, the better. This refreshing mango sorbet is a perfect treat for a hot summer day, but it also makes a wonderful palate cleanser for an Indian dinner or any heavy meal. No ice cream maker is needed to make this silky, easy sorbet. During the summer, ice cream maven Jeni Britton loves to make sorbets with locally grown heirloom melons. Jean-Georges Vongerichten first developed this breezy lemon-thyme ice for F&W, then started serving it as a special at his Mercer Kitchen in Manhattan's Mercer hotel. "Lemon-thyme, that's my guy," Vongerichten says. "I would use rosemary too." Here, a simple combination of sugar, water, hibiscus tea (often sold as Red Zinger) and grapefruit juice gets churned in an ice cream maker.